Not too many researchers know about Abigail Patterson, a child who was baptized in 1740 in Augusta Co VA on the frontier. And those who have seen that record, assume she was the daughter of the wrong Robert Patterson. However, in March of 2009 it was discovered this young girl was actually the daughter of Robert and Sarah Patterson, of Linville Creek. In fact, this is the only known record of an Abigail Patterson as the daughter of Robert. I would suggest we'd never have caught onto her were it not for the fact that someone else was baptized the same day. Someone we do recognize. Her Uncle Jeremiah Harrison. Rev. John Craig was the first resident Presbyterian minister in Augusta Co VA. He was there from 1740-1749, and baptized a lot of people both children and adults. He kept meticulous records of these baptisms, for which we are truly grateful. ﻿You may click on the image to see a larger version of it. Notice on November 3, 1740 there were two individuals baptized. Robert Patterson brought his child Abigail, and then Jeremiah Herison (Harrison) was also baptized. It also denotes the fact that Harrison was "an adult person." The first item of importance is that Jeremiah Harrison was married to Elizabeth Patterson, sister of Robert. More importantly, though, is the unusual notation as to the location of the baptisms. It says "near Halfway House." "Jeremiah Harrison, besides his brothers, owned various tracts of land on Cook's and Linville's Creeks. From his first patent for 370 acres on the drafts of Cook's and Linville's Creek it appears that he settled in the section now traversed by the Raleigh Springs Turnpike; probably near the present juncture of this pike with the road leading to Mt. Clinton. Just to the east of this juncture the pike crosses the northernmost branch of Cook's Creek while a little to the west the Mt. Clinton road crosses the southernmost branch of Linville's Creek. In the old church book of the Rev. John Craig, the first resident Presbyterian minister in Augusta, Jeremiah is spoken of as living at the 'Half Way House'. His name occurs on a petition for a road filed at Augusta court in 1753-54, by the 'Inhabitants of North Mountain, at the head of Muddy Creek'. The above juncture of roads is approximately midway between Harrisonburg and Mt. Clinton, and Jeremiah was probably about half way between Thomas Harrison's and the Muddy Creek community." Thomas Harrison was Jeremiah's brother. Thomas' land became the town of Harrisonburg, which was named for him. So half way between Thomas Harrison's (the town of Harrisonburg) and the Muddy Creek community (a few miles west). 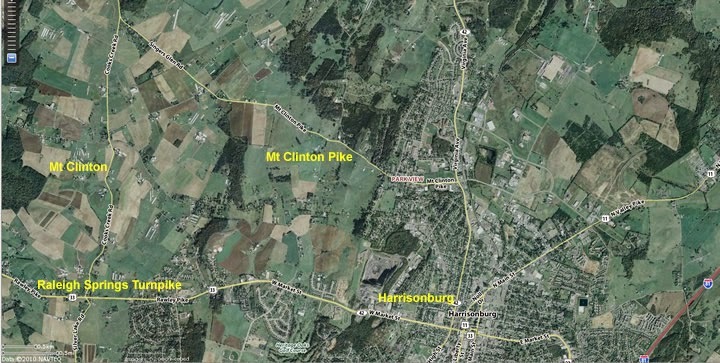 See the following map which shows the town of Harrisonburg, as well as Rawley Pike (Raleigh Springs Turnpike) and Mt Clinton Pike, etc. Robert Patterson, father of little Abigail, also lived "on the waters of Cook's and Linville's Creeks". Therefore he lived fairly close to his brother-in-law Jeremiah. The fact that only a handful of baptisms during the 1740's were actually performed "near Halfway House", and two of them were the same day, I'd say there's no doubt this Robert Patterson was of the Linville Creek variety. While we don't know exactly how old Abigail was, we do know that some infants as young as a few weeks old were baptized by Rev. Craig. Others I'm sure were a few years old, and as we've already seen, he baptized many adults as well. Did she die young? Could be. Did she get married in VA prior to the clan's move to the Carolinas? It's possible. What we do know is that her father Robert did not mention her in his will in 1775 in York Co SC. He did say something about "all my children is single" at one point, but that hardly sheds any light on the matter. However, it could be the one inclusive statement regarding Abigail if she was still living. E-502. 13 July 1797 Peter Patterson of York County to Malcolm Henry of same for £150 sterling, 150 acres on the waters of Clarks fork of Bullocks Creek being Pattersons branch of Clarks fork and also 80 acres adjoining it near Peter Patterson's lower field, the ridge road above Jacob Peters School House, Robert Love's corner at cross road and -------Ponder; also 62 acres on both sides of Clarks fork adjoining and originally granted to Robert Patterson Senior, deceased. Signed: Peter Patterson (Seal). Witnesses: Robert Love, William Henry, Abigail Patterson. Proved: 8 April 1801 by the oath of William Henry before Saml Watson J.P.
Who was this Abigail Patterson? She was not Peter's wife as it says nothing about being examined privately regarding releasing her dower. Was she Peter's daughter? Was she Peter's sister? 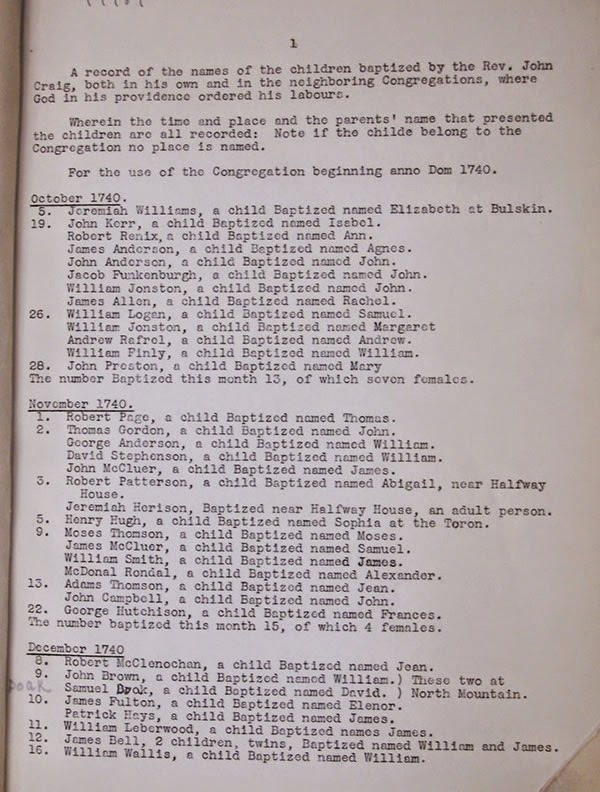 Keep in mind that Peter was a son of Robert Patterson and therefore a younger brother of the Abigail who was baptized in 1740. Their father Robert had died in 1775. Their mother Sarah died in 1790. It seems that another sister, Sarah Patterson Black, lived on some of the family land during the 1790's also. It could be this was the same Abigail from 1740, and she never married. We may never know for sure, but I have to consider the possibility. Just how many children DID Robert Patterson have?